In our work with literally thousands of patients, we've identified the critical habits of people who maintain a healthy weight, and the habits of those who don't. With The Mayo Clinic Diet, we've boiled this research down to five simple habits to help you take off the extra weight -- and five habits to break so that you can keep it from coming back. Plus, we've made it easy, because what works best when it comes to weight loss is keeping it simple! Loose it! is a two-week quick-start program designed to help you lose 6 to 10 pounds in a safe and healthy way. Live it! is a long-term plan in which you continue to lose 1 to 2 pounds a week until you reach your goal. Then, you learn how to maintain your healthy weight for life. All the extra stuff includes meal planners, recipes, tips on overcoming challenges and much more to help you along the way. The Mayo Clinic Diet puts you in charge of reshaping your body and improving your health -- for a lifetime. 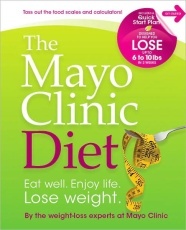 For more information, visit The Mayo Clinic Diet book Web site.